Songbird was my Valentine’s Day gift to my husband – made with love, for the one I love! 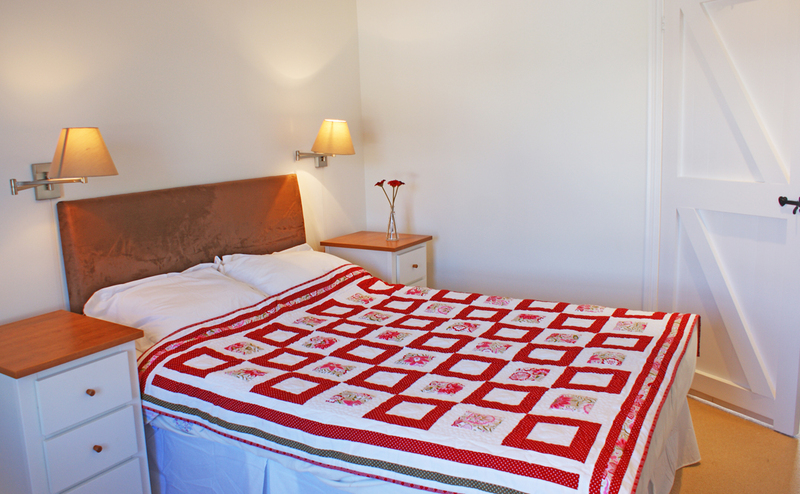 Cottage bedroom with snuggly quilt (if only we were this tidy at home)! 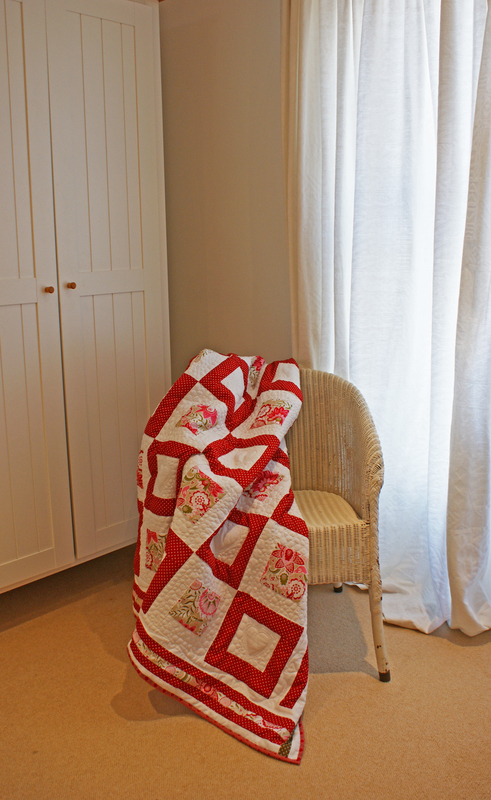 Lloyd Loom chair & quilt – minimalist chic! 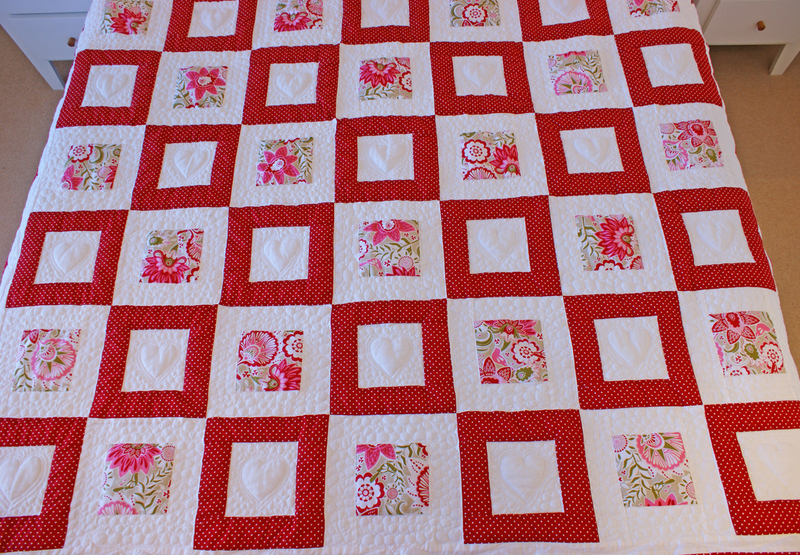 Songbird is a very special quilt. When I saw the signature fabric, I loved it straight away – flowers, pretty little birds and soft colours. I’m much into the Scandinavian influence at the moment and am quite obsessed with using pure white. When quilted, the patterns look like the purest snow! Songbird is backed with white flannelette so it’s very soft and snuggly. 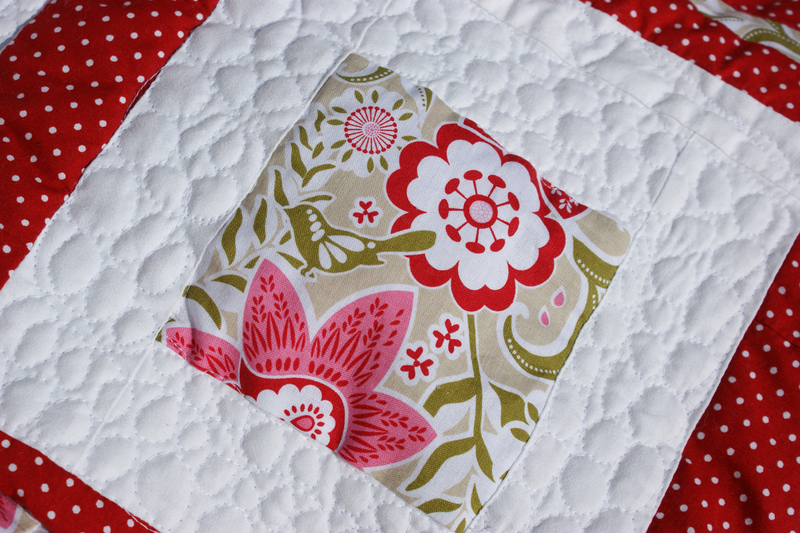 The close-ups of the quilted blocks play tricks with me sometimes – do they with you? Instead of looking puffy, sometimes they look concave! They are definitely puffy! I quilted all the pure white blocks with a contour heart surrounded by free-motion quilted pebbles to remind us of our favourite holidays by the sea in Cornwall. 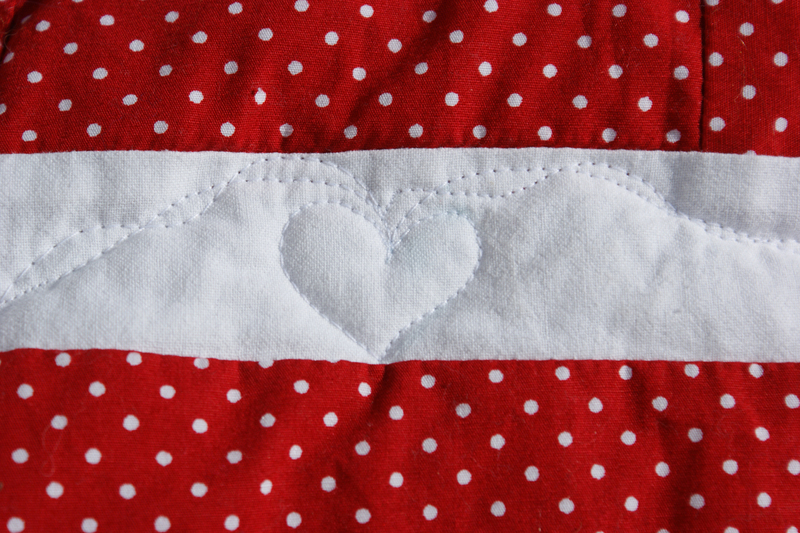 All the white borders are the same but on the outside borders I quilted little hearts and ribbons in a band all the way around – almost 60 hearts in total! Songbird will have to double up as all my happy:smiley post too, this week. I loved the time we spent in Cornwall, I loved walking the dogs on the beach at sunrise, I loved coming back home to a quacky welcome from Flora. I want to quilt long into the chilly nights then drift to sleep and dream of fabrics, new designs, future plans and warmth, beneath a quilt full of hearts! Long, long live love! What have the Handmade Monday gang been up to this week? Pop over to see them at Wendy’s Handmade Monday No 105. I’m also linking up to New to Me in 2013, as my free-motion quilted pebbles and contour hearts are both new quilting techniques. PS just remembered that I wanted to say that I finished another, smaller Scandinavian design quilt last week. At least, it’s pieced but not quilted just yet. I was sidetracked by a cushion that I simply HAD to create. I’ll post some photos when the sun’s out and the quilting’s done! Now that you mention it, the photos do make some parts of the quilt look concave. I hope you received an equally wonderful Valentines Day gift too. Simply beautiful, and gorgeous photos to show Songbird off. I agree with you the white stitched quilting does play tricks with your eyes. The quilt looks totally stunning and must have been so much work. Your break in Cornwall sounds fabulous. What a beautiful quilt. The detail is amazing. Wow! Your photo is fantastic – you have had some lovely weather! 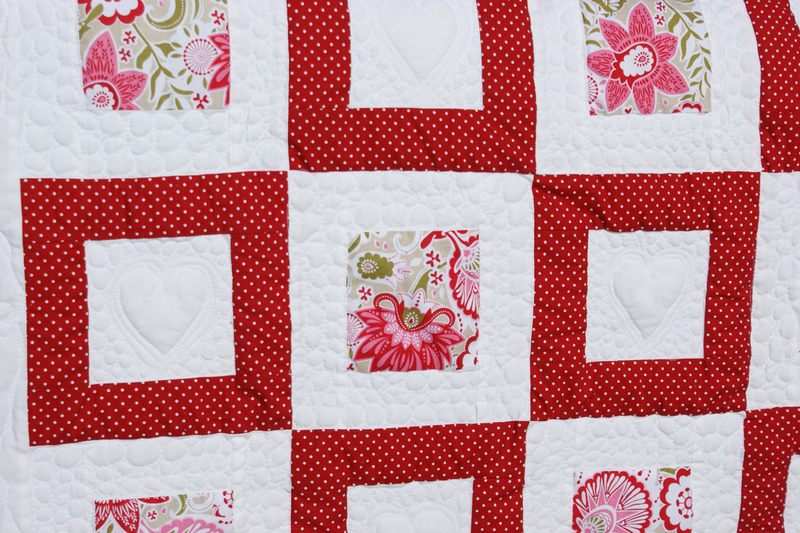 Your quilt is beautiful – I am in awe of your quilting stiches. I would love to have a go at making a quilt but am a bit daunted by the stitching. I’ll build up to it I think! Oh my word -it’s just amazing. And I LOVE your photography! Just have a go – it’s fun when you get into it. 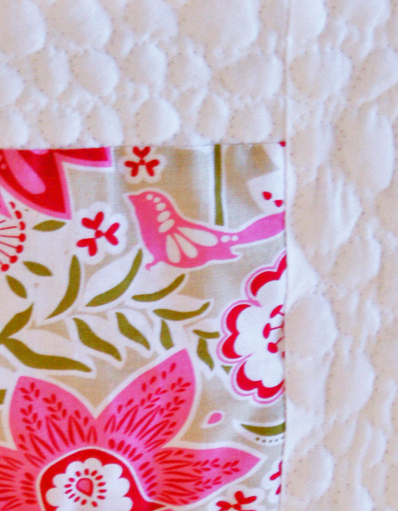 I love free-motion quilting. Practise on some smaller blocks or cushions first. I also do a lot of sighing about the scenery in Cornwall last week! What a wonderful Valentines present to your husband! The cottage you stayed in looks stunning and it must have been wonderful walking the dogs at sunrise. I always miss it so much when we get back – for a few days, at least. I took some wonderful photos of the sunrise, but then found I’d forgotten to put the memory card in my camera – the air was blue! Love the beautiful quilting on this 🙂 Good luck hunting for your circle victim, if you can do this, the circles will be a breeze! Thanks for commenting – I’m still hunting! Yes, I had the best present – all his love! I’ll keep it safe. 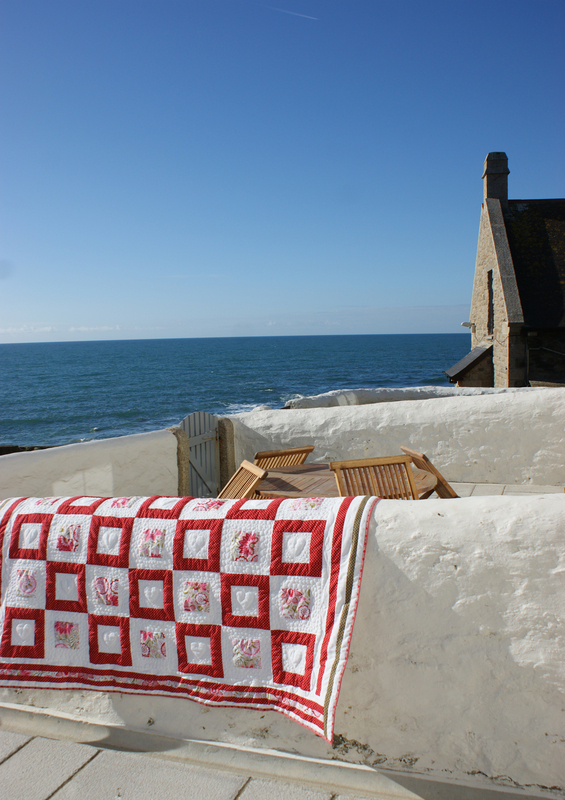 and does’;t it look fab draped on the limestone washed wall of a Cornish seaside cottage? Beautiful. Not sure I did know that! I’ll investigate!! Thank you for popping over – we’ll keep in touch. Thank you – it’s taken a bit of practice! Your quilt is gorgeous and the photos are spectacular too! Congratulations on mastering the fmq’ing. Thanks for linking up to New to Me in 2013, you have certainly given everyone some great inspiration! what a beautiful quilt! And what a beautiful view of the sea too! You are currently reading Scandinavian Quilt – Songbird at Adaliza.